Vitamin D has been added to help support general good health and B vitamins to help metabolize carbs, fats and proteins. This popular ingredient has also been added in a convenient, easy-to-swallow capsule format for those who don't enjoy the tar taste of vinegar. Results from two randomized, double-blind, placebo-controlled studies. 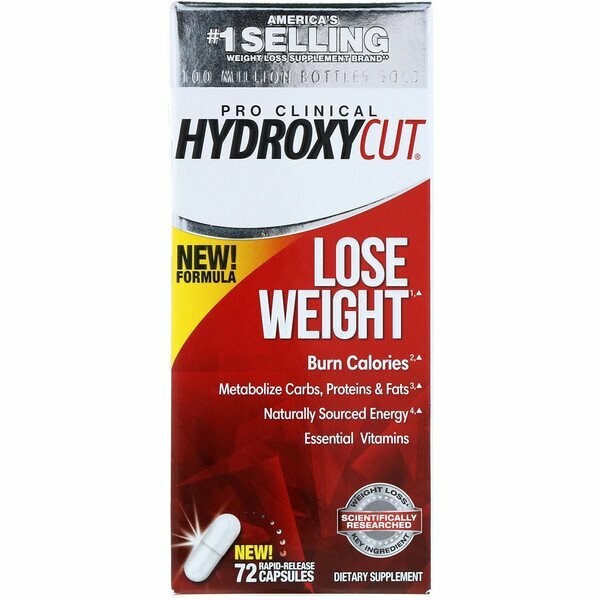 ¹Subjects taking the key ingredient in Hydroxycut (C. canephora robusta) for 60 days lost an average of 10.95 lbs. versus the placebo group, which lost an average of 5.40 lbs. Both groups followed a low-calorie diet. In a separate 8-week study, subjects taking C. canephora robusta lost an average of 3.7 lbs. versus the placebo group, which lost 1.25 lbs. Both groups followed a calorie-reduced diet and performed moderate exercise. 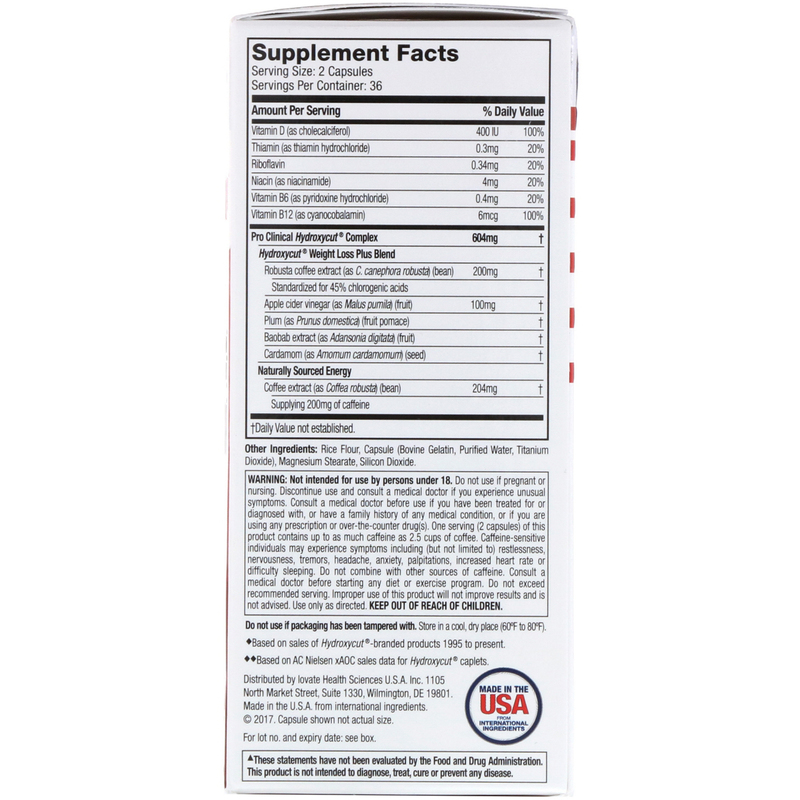 ³Contains B vitamins, which help with the conversion of carbs, protein and fat. 4Contains naturally sourced caffeine to help increase energy. To assess individual tolerance, for the first 3 days, start with one (1) capsule, taken with a glass of water two (2) times daily, approximately 30 to 60 minutes before your 2 largest meals. For days 4 and beyond, follow the chart below. Do not exceed two (2) capsules in a 4-hour period and/or four (4) capsules in a 24-hour period. Do not take within 5 hours of bedtime. For best results, use Hydroxycut for 60 days in conjunction with a calorie-reduced diet and regular exercise program. Consume 8 glasses of water daily for general good health. Read the entire label before use and follow directions. Rice flour, capsule (bovine, gelatin, purified water, titanium dioxide), magnesium stearate, silicon dioxide. Not intended for use by persons under 18. Do not use if pregnant or nursing. Discontinue use and consult a medical doctor if you experience unusual symptoms. Consult a medical doctor before use if you have been treated for, or diagnosed with, or have a family history of any medical condition, or if you are using any prescription or over-the-counter drug(s). 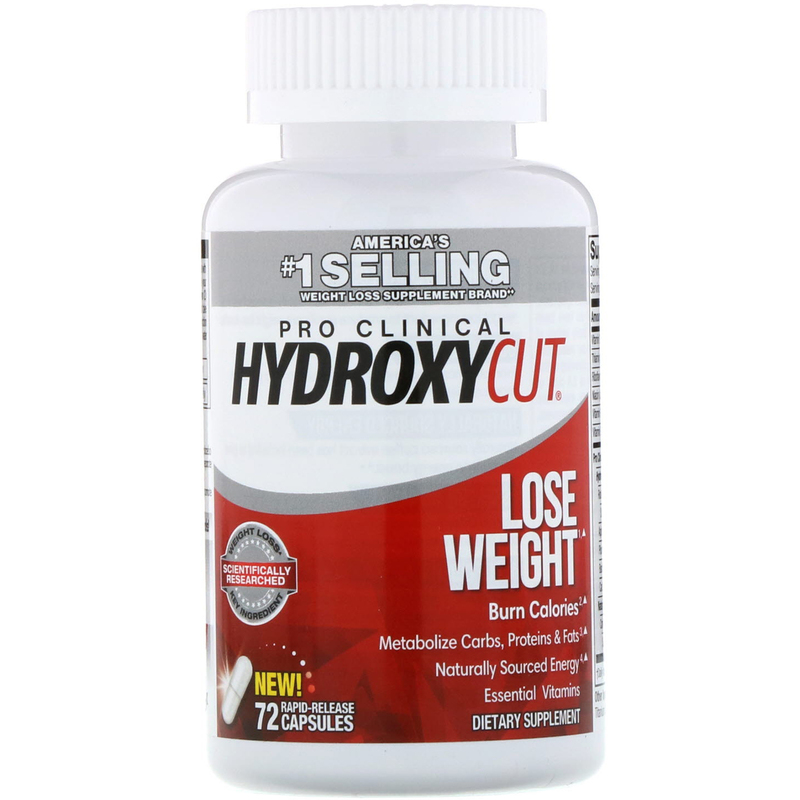 One serving (2 capsules) of this product contains up to as much caffeine as 2.5 cups of coffee. Caffeine-sensitive individuals may experience symptoms, including (but not limited to) restlessness, nervousness, tremors, headaches, anxiety, palpitations, increased heart rate or difficulty sleeping. Do not combine with other sources of caffeine. Consult a medical doctor before starting any diet or exercise program. Do not exceed recommended serving. Improper use of this product will not improve results and is not advised. Use only as directed. Keep out of reach of children.